In an effort to pay back the kindnesses that has been shown to me over the last year, I am having 5 giveaways. =) All fabrics in the giveaways are from my own personal stash. Todays giveaway is if for 17 fat quarters plus some scraps of Moda's Lily and Will in the pink color way by Bunny Hill Designs. To enter, leave one comment sharing your favorite quilting/sewing gadget. My favorite quilting and sewing gadget is my Clover seam ripper. 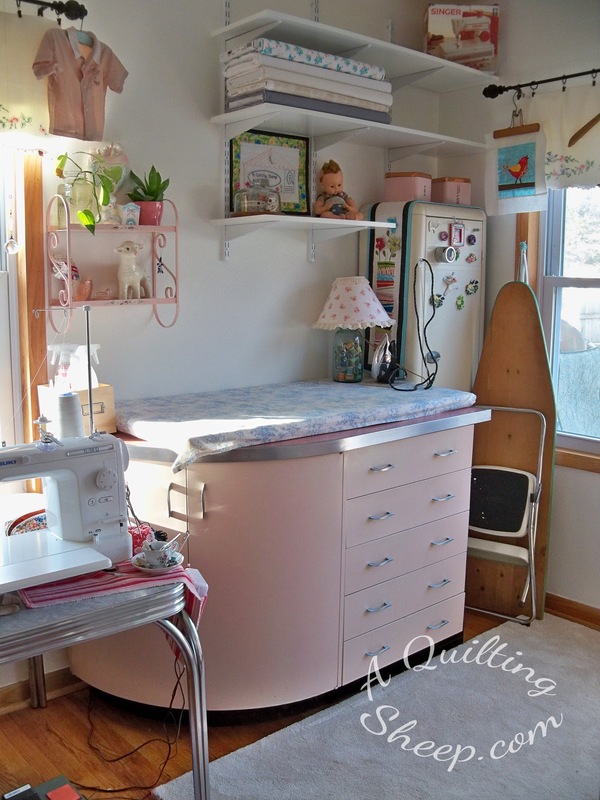 I have been sewing for over 40 years and it is the best seam ripper I have ever owned! I have to say that maybe not favourite, but necessary is my thimble. Every time I hand stitch I use it. I would have to say my rotary cutter is my favorite tool. 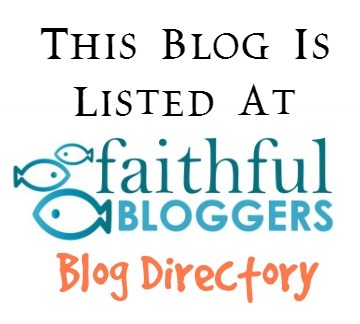 Thank you for including international readers/followers of your blog! I appreciate the opportunity. My favorite and very necessary sewing gadget is the Clover threader. I do a lot of work by hand and with my eyesight not being what it was anymore it is a wonderful little helper! You always choose such beautiful fabrics,Amy! 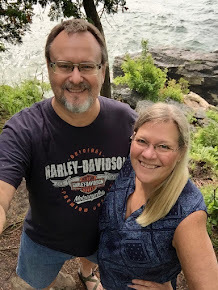 It's very hard to choose just one favorite gadget--but since I began my quilting adventures before they existed, I know that my rotary cutter has saved me countless hours of cutting time! I'm so looking forward to seeing what other readers choose as their favorite gadget. It's my lighted and magnified seam ripper. With it the ripping goes so much easier and faster! and you know there will always be ripping. My rotary cutter is my best quilting friend. Thank you for the give away. My rotary cutter has been my favorite gadget since I started quilting. Accurate cutting is the key to accurate piecing :-) Thanks for sharing and paying it forward. I love my little gingher scissors on my retractable tool leash. Thanks for the chance to win. I like my seam ripper and my thread snips. It has to be my thread snips, love those little things. Thanks for the chance and of course I'm a follower, wouldn't want to miss anything. My favorite is my rotary cutter. I remember the old days of scissors and templates. No going back. Thanks for the chance to win some pretty fabric. My favorite quilting gadget is my June Taylor ruler. Not sure how I cut fabric before I had this ruler. Thanks for the great giveaway. I love this fabric. Hi,it would be my scissors, so necessary,could not work without them! Thanks for a lovely giveaway! So many good answers. I can't pick just one gadget. I would say rotary cutter, thimble and Supreme Slider. I love paper piecing (perfect points every time without tearing your hair out!) so my favorite gadget is the Add a Quarter ruler. By the time I get done with a block even the BACK looks great! I love my Creative Grids rulers. My favorite quilting gadget is my computer. Ha. :-) I've learned SO MUCH about shortcuts for quilt making with it. I really don't think I'd have done as much as I have if it weren't for this wealth of new information. I did some before this came along, but not as much and not with as much interest. What a valuable tool! Recently, my favorite gadget has been my add-a-quarter ruler! Thanks! My favorite gadget is my 1/4" piecing foot with guide. It sure makes getting my scant 1/4" seam easy! I would have to say my favorite gadget is a set of Karen Kay Buckley Perfect Scissors. I have them in 3 sizes and just love them especially for trimming applique pieces. 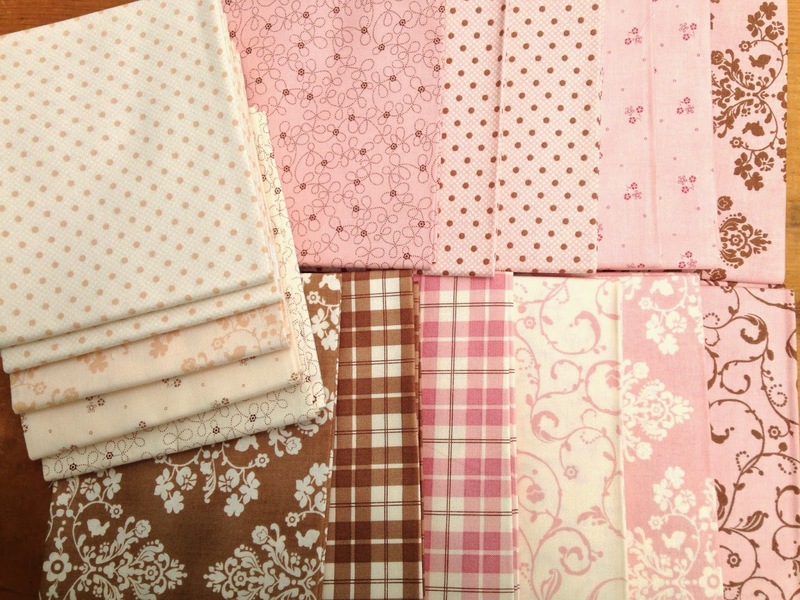 I just love these pretty fabrics you have in the giveaway... just the color I need for my Dear Jane! Thanks for the chance to win! I love my 6 1/2" square up ruler! Hi Amy - I'm not entering to win since I won your first giveaway, I just wanted to leave a comment. You and I seem to have very similar tastes in fabric, the Sherbet Pips I won is fabric I've used before and I've made a quilt using the pink Lily & Will! I think my favorite quilting gadget is a 10" long ruler 2 1/2" wide. It's perfect for cutting binding strips. Thanks again for the giveaway last week - I've received the fabric and have been petting it, trying to find the perfect pattern for it! I'd have to say, my seam ripper! I unfortunately have used it way too much at times. :) LOVE the pinks!! Thanks! My favorite gadget is my seam ripper. It saves my sanity and I make sure I replace it every year. My favorite gadget is my "Quilter's Magic Wand". My favorite sewing tool is my Roxanne's thimble. Some probably wouldn't consider this a gadget, but it's my new favorite thing. It's my Accuquilt Go and Studio cutters and dies. I love how much faster I can cut things out now if I could just sew faster. I like my 1/4 inch tool I use it to check my 1/4 inch seam on my machines, for marking my corners when I am binding. You are so sweet and generous! My favorite tool has to be my 1/4" foot. It is helping me as I learn to have matching seams. These fat quarters would make cute baby quilts for our local pregnancy center! My favorite gadget has to be my folded corner clipper ruler. Thank you for such a generous giveaway. Gotta be the rotary cutter! My favorite tool is my revolving mat. Thanks for your generosity! Hi Amy, Rosemary B here! My favorite tool is most absolutely my clover clips, the red ones. Those are incredible. Now I might need to get the green bigger ones if I make anything big enough for them. They are perfect for stability, and I do not get stabbed! Thank you for sharing your stash clean up with all of us and offering this give away. I love those little rubbery fingertip thingies that I use when machine quilting. I find that without them, my hands slip too much which increases frustration. Thank you for this amazing give away! I really love my rulers and rotary cutters. Can't imagine cutting out a quilt without them. It has to be my walking foot, I use it on every quilt I make. Its a must for attaching the binding. I also love scissors - of any kind. 32 pairs and counting! My favorite tool is my rotary cutter! I have arthritis and simply could not function as well if I were cutting with scissors. Thank you for the giveaway. My little snips are my fav when sewing anything!! Wouldn't be caught without them. :) Thanks for the chance. Seam ripper rules my world! And I would love this pink Lily & Will collection. I'm new but I would have to say so far is my rotary cutter! Thanks so much for the giveaway! I am sad to say my favorite or most used tool is my seam ripper. I haven't been quilting long so I spend lots of time "unsewing"
I don't know what I'd do without my rotary cutter! And I do remember quilting before we had them! I love Bunny Hill Designs! My favorite gadget will always be my seam ripper! Although, I also find many uses for wonder clips! Thanks for the awesome giveaway. Hmm, this is a tough one...can't live without a seam ripper, I guess. Hope you have a great day. Those are precious, thank you! Love these great fabrics! My fave gadget is my 1/4" foot - I don't always have straight fabrics on both edges, but that foot gives me a perfect 1/4" seam every time! oh my heart be still!!! I so want this fabric. my fav gadget/tool is my 1 x 6 ruler. I have several I use them all the time. it is a perfect tool! I Just bought a Fiskars Hexagon cutter. It is a great tool. It punches out Small, med., large, and x-large Hexies in a snap! Can not go without my seam ripper with a eraser on the end! The eraser catch all those loose ripped cottons, without using your fingers tips! Quick and easy. Who does not make mistakes? I do! I love my rotary cutter and ruler, because I cannot cut in a straight line! LOL I love that fabric. I'm sure you know that I follow you!